Yes, your small business needs to have a website. No excuses. People are searching for your service online. Without a website, you are missing out on an opportunity to pre-sell them on how awesome you and your products are. In some cases, you will lose business because your competitor had a website. I realize not everyone has the budget to hire someone to help them when just getting started. Some of you have more time than money. 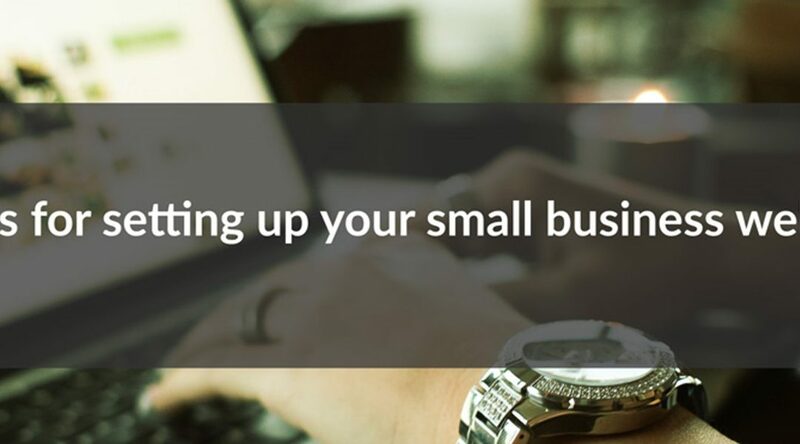 If that is you, here are four tips for setting up your own small business website. At first, you don’t need anything more than a simple, one to three page site. These tips will get you there. Use a domain registrar to acquire your domain name (your URL), such as Namecheap or GoDaddy. You use these tools to basically manage registration of your URL with the internet. It’s a good idea to separate your domain registrar from your host. It adds an extra step now but it makes it much easier if you want to switch hosting providers later. Your domain should match your business name. It is not always possible to get your exact business name. Yes, you should try to get a .com, unless you are a non-profit or an association. In that case, a .org is more appropriate. If your business name is not available, here are a few best practices for finding an alternate domain name. Avoid hyphenating, if possible. You are not required to use GoDaddy’s Website Builder (or name your domain registrar tool here). I have heard that Website Builder can produce a decent website but I have never seen even one good looking one in the wild. It easier than you think to use some of the great do-it-yourself tools out there. Here are a few reputable DIY tools you should consider. Comparing these could go on forever, so I’ll just list here. Browse around their websites and pick whatever feels better to you. There is not a wrong answer at this stage. All of these tools have great help and documentation. Spend a few minutes reading their getting started guides and then just get in there and try stuff. It is better to have something rather than wait to have something perfect. Pick a template that you can live with, preferably one that is optimized for both desktop and mobile viewing. Keep your content short and simple. Try to include terms that people might use when searching online for a business like yours. If your tools lets you, include a simple slider with a few pictures of your products or you on the job or other pictures that visually shows your value. I’ve seen a lot of people make the mistake of creating an image with their name, address and phone number to use in the header of their website. Resist this temptation. Search engines are looking for your address and phone number in your website’s text. Your customers want to copy and paste or click on that information in text form. Putting this information in an image frustrates potential customers and reduces your ability to rank higher in search engines. Pro tip! Make your phone number a clickable link. You may not realize that you can make your phone number a link much like a website link. Doing this makes is such that when someone clicks on your phone number, it automatically transfers your number to their phone app. Why should you do this? Because you want to make it as easy as possible for your potential customers to reach you. Remove as many barriers as possible. In your website editor tool, select your phone number and use whatever button lets you insert a link. Instead of typing an http:// link, you type in a tel: link. Instead of http://yoursitehere.com, you’d use tel:5554446666. You can use this trick to add call-to-action buttons, like a button that says “Call now (555) 444-6666”. I do suggest repeating your number in the button text for those that are looking at your site from a computer, not a phone. Google Analytics is a free tool that allows you to track how many people are viewing your website. It tells you things like how they found your site. Did they find you by searing on Google or Bing? Did they click on the link in your Facebook profile? Were they on a mobile device or computer? What kind of mobile device? This may not seem like a big deal now but at some point, you will want to know this. If you eventually decide to buy Facebook, Google or Bing ads, you’ll want to be able to see how your website traffic was affected (and not just see what those providers tell you). Here are the simple steps to signup for Google Analytics. Click Admin in the menu bar at the top of any page. In the ACCOUNT column, select Create new account from the dropdown menu. Under the section called Setting up your Account, enter your business name. Under the section called Setting up your property, enter the Website. Enter the Web Site URL. Under the Data Sharing Settings section, select the settings you want. Learn more about the data sharing settings. Most DIY providers have a place to paste this tracking ID. Refer to your system’s documentation. If you follow these tips for setting up your first (or even second) small business website, you will have covered the basic needs of your potential customers and have laid groundwork to make better decisions for your business as it progresses online. If you get stuck, let me know. Usually the issue is really simple fix that you can do yourself. If you need help, send me an email at info@idestini.com or list your issue in the comments.